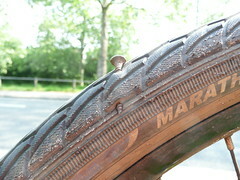 Cycling to work, and get a screw in my tire. Just as well it wasn’t my front tire otherwise I’d have had to walk the rest of the way, or find a bike shop. Instead I just unscrewed it (and took the screw with me so that the next cyclist doesn’t run over it. This entry was posted in Cycling on May 23, 2008 by smsm1986.